“Nothing, but nothing, can prepare you for the wonder that is Petra,” said Alice Brudenell-Bruce in the Financial Times. 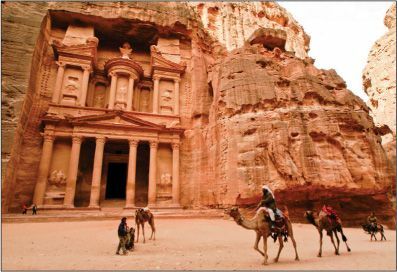 Carved from the pink sandstone cliffs of Jordan’s southwestern desert 2,100 years ago, Petra is an ancient city of majestic temples and tombs that you reach after walking in darkness through a long, narrow mountain passageway. At my side as I step into the sunlight is Konstantinos Politis, one of the world’s preeminent archaeologists—there because my visit was arranged by the bespoke tour operator Cazenove + Loyd. Politis conjures up the city’s lively past, telling me of the Bedouin who once trekked for weeks across the desert to trade frankincense here. And I am only beginning my nine-day group tour through Jordan, one of the most welcoming countries in the Arab world. The tour operator has extraordinary pull in Jordan, as our group discovers when we arrive at the Royal Stables, home to 88 of the royal family’s purebred Arabian horses. In an arena of emerald grass, several past prizewinners are trotted out before us, and each steed is more elegant than the last. For the finale, a gray stallion named Jamil prances proudly around the ring, “somehow hovering midair between strides.” Outside, another surprise awaits: a gleaming parade of vintage automobiles from the late King Hussein’s personal collection. I leap into a 1932 Morris Cowley Tourer, and we drive to the Royal Automobile Museum in Amman for a private tour.